For maximum wow factor in a confined space it’s hard to beat the trusty hanging basket. This week, I’ve been busy preparing hanging baskets ready to house gorgeous pink Busy Lizzies (Impatiens), cascading pink, white and purple “Sweetie” Sweet Peas and succulent Tumbling Tom Tomatoes. My Busy Lizzies arrived in plug form from Van Meuwen’s this morning. 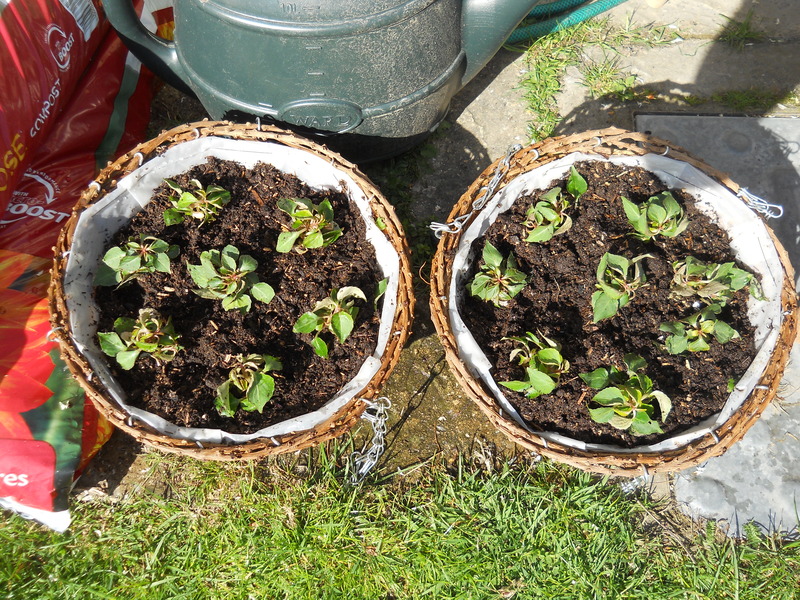 After giving the plugs a quick water I filled two hanging baskets with multi purpose compost virtually to the rim and watered. I then subdivided 14 plugs between the two baskets. Busy Lizzies are happy in partial shade and are ideal for planting under trees and in shady corners as well as hanging baskets. After potting, keep the plants warm and water well. BL’s are extremely versatile and will grow well in most conditions but do benefit from some shade during a hot summer. Moisture is important so do plant in good compost or well-prepared soil. If your plants become too tall, cut them back by a third, using a sharp knife, and new shoots and blooms will soon reappear. Water well in dry weather but avoid water on the foliage. “Sweetie” Sweet Peas are a dwarf type of sweet pea perfect for growing in hanging baskets. the seeds evenly over the surface and cover with a dusting of compost, adding water to make the compost moist but not wet. Place the basket in a warm place indoors, away from direct sunlight and keep moist at all times. 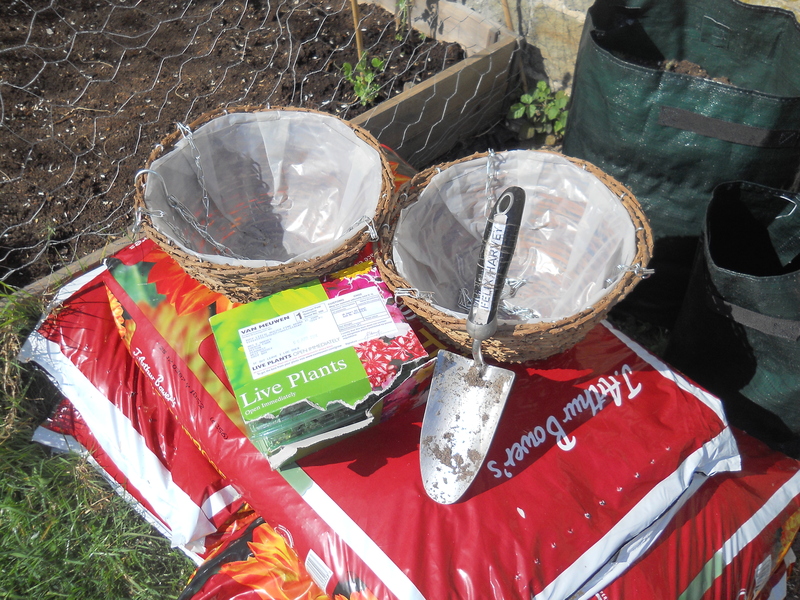 After seeds have sprouted the basket can be placed in a sunny, sheltered spot outdoors. I bring mine indoors at the first sign of frost and flowers should appear from July to September. Pick out flowers as soon as they begin to wilt to encourage repeat flowering. Tumbling Toms are ideal for growing in hanging baskets and containers, from which they will “tumble” bearing lots of large “cherry” size fruit. They require no support and are best grown in a sunny position outdoors. 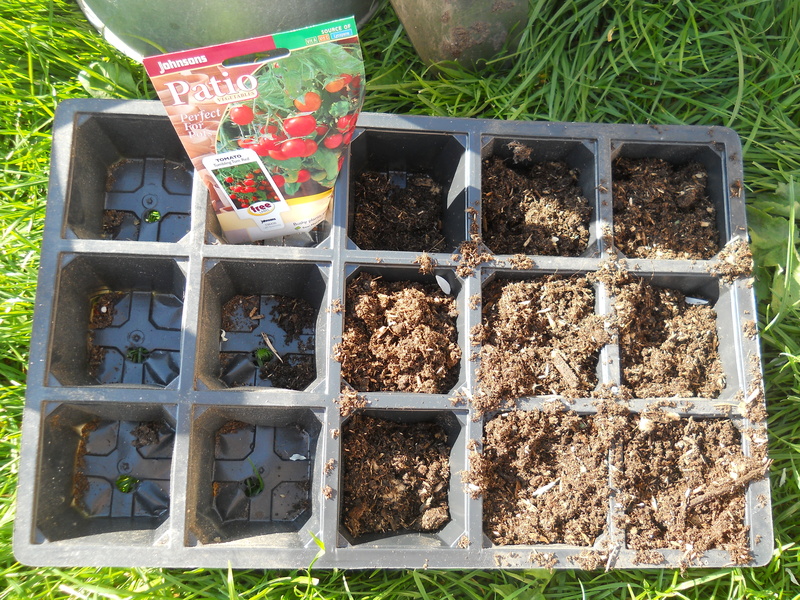 I’ve sown my Johnsons Tomato Tumbling Toms in seed trays. They’re perfect for indoor sowing between March and April. 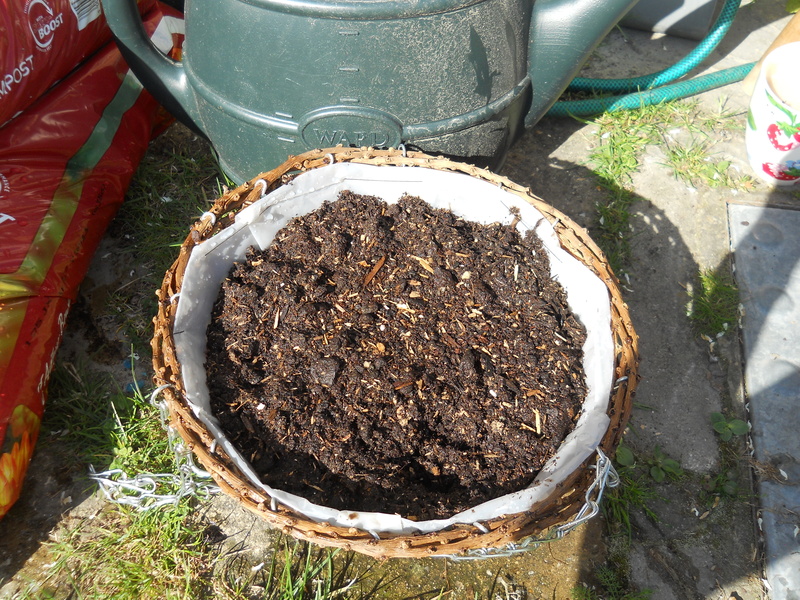 I sowed one/two seeds per segment and covered them with a fine layer of compost before firming gently and watering. Next cover with glass, polythene or a propagator lid and keep at approx 15-20C. Seedlings should appear between 7-14 days. Stand outside for few days in late May to avoid frosts before planting out 45cm apart. 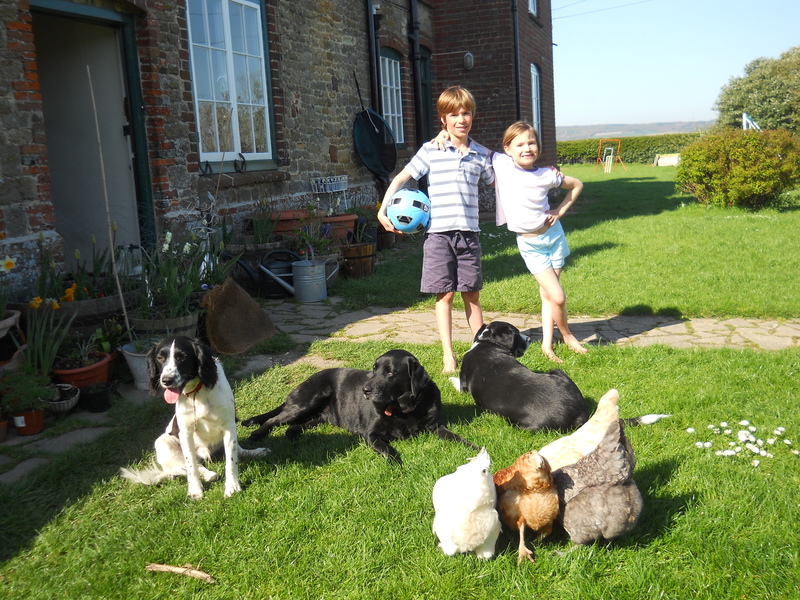 Harvest between August to October. And finally to all my regular readers a huge apology for the delay in posting this installment. Unfortunately, due to work commitments, a camera malfunction and the motley crew above I haven’t been able to post as much as I would like. 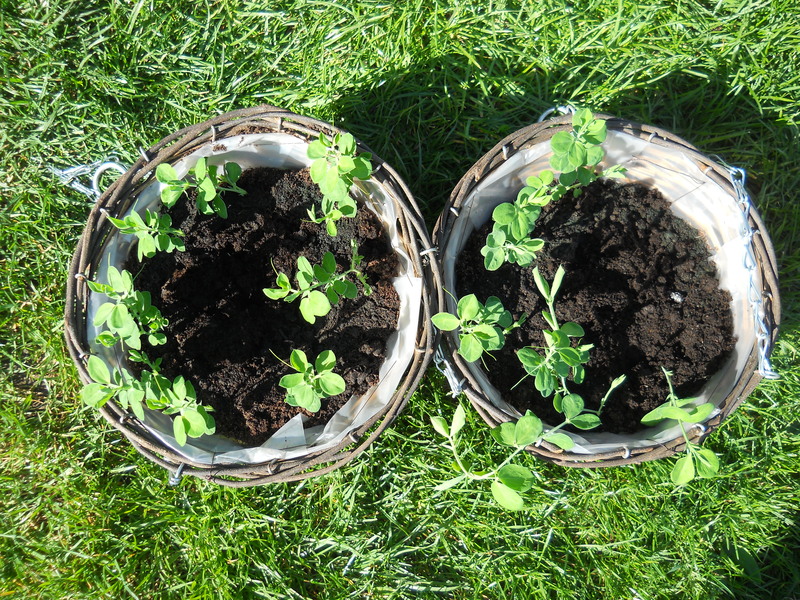 This entry was posted in Gardening and tagged Basket, Garden, Hanging, Hanging basket, Home and Garden, Plant, Seed, Shopping, Sowing, Sweet pea. Bookmark the permalink.